Excavation equipment is used to search for an oil leak close to where the TransCanada Corp's Keystone oil pipeline runs through northern St. Charles County, Mo., on Feb. 7, 2019. TransCanada Corp said on Monday a stretch of its Keystone crude pipeline from Nebraska to Illinois remained shut after a leak was discovered in the area of St. Louis, Missouri, last week. The cause and source of the spill have not been determined and there is no estimated timeline for a restart, TransCanada spokesman Terry Cunha said in an e-mail. The closure affects the line that runs from Steele City, Nebraska, to Patoka, Illinois. The discount on Canadian heavy crude compared with U.S. light oil traded at about $11.50 per barrel on Monday, slightly wider than Friday’s level of about $11 a barrel, according to Net Energy Exchange. Excavation crews worked through the weekend, but work was hampered by inclement weather, a spokesman for Missouri’s Department of Natural Resources said. 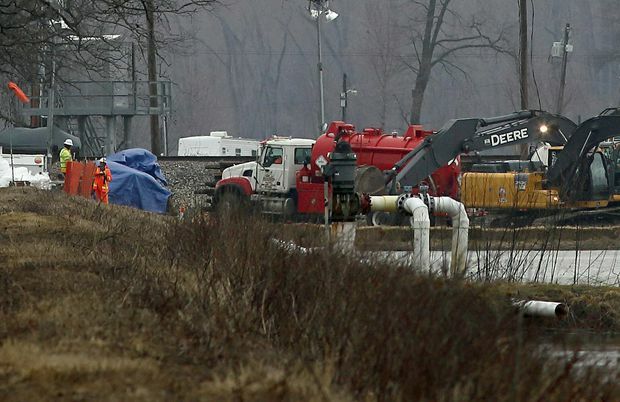 The total amount of oil spilled has not been determined and contractors will assess the exposed pipeline on Monday, spokesman Brian Quinn said in an e-mail.